Welcome to Marvel Strike Force Heroes page. This is the full description of MSF Yondu stats, skills and abilities. Yondu is a versatile Cosmic Support who can play any role in the party. His first skill inflicts medium Piercing damage and clears up to 2 positive effects from the target. His second skill summons one or two Ravager allies and applies Offense Up on them. Yondu ultimate delivers medium undodgeable Piercing damage to all enemies. In addition, Yondu has the ability to copy positive effects from the enemy to himself and to clear that effects from the enemy while boosting the damage of his Ravager allies for 5%. It may not seem but Yondu is the best supporter at the moment and his skills are applicable to any team synergy. Yondu can be farmed early in the game and his price is 45 shards obtainable through Mega Orbs, Premium Orbs, 1-9 Heroes Assemble campaign mission and 6-9 Nexus campaign mission. Yondu is a leader who can summon Ravagers allies and deliver high piercing damage. 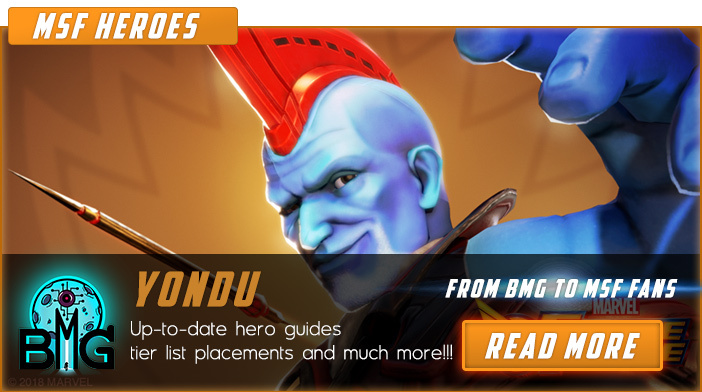 We hope that you enjoyed the description of MSF Hero Yondu. For detailed information about other MSF Characters check our MSF Heroes page.